Hamilton police say they're looking for two people dressed like construction workers after reports of a shooting on the Stoney Creek Mountain Monday morning. An Ontario man is now facing multiple charges after a shootout between two people dressed as construction workers that broke out in Stoney Creek back in April. 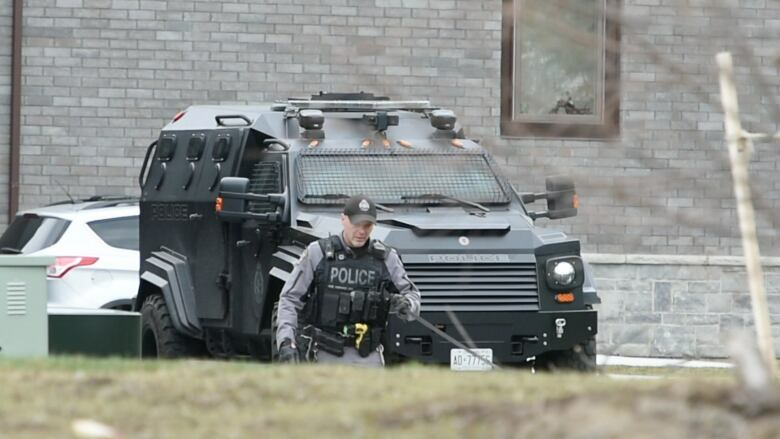 Police were first called to a townhouse at 23 Echo Valley Drive on the Stoney Creek Mountain on April 23. Police say two men were involved in some sort of shooting incident, but ran off before investigators got there. While they were looking over the scene, officers found a DNA sample and sent it in to be analyzed, a police news release reads. Canadian Forensic Services confirmed it was a positive match with a profile they already had on file. Then on Dec. 3, the man who matched that profile was arrested during the execution of a drug squad warrant in Ottawa, police say. He was arrested and taken back to Hamilton. A 33-year-old Nepean, Ont. man is now facing six firearm-related charges, as well as charges of failing to comply with the terms of his probation, and possession of a firearm contrary to a court order.